Carbon Storage and Restoration: The Only Way Forward! 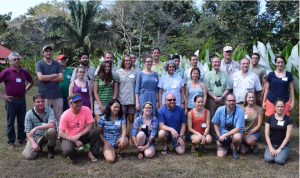 Last week, here at Piro Biological Station, we celebrated the Carbon Sequestration and Restoration in the Lowland Tropical Forests Workshop organized by Osa Conservation and sponsored by the Bobolink Foundation. All of the sudden, Piro Station was buzzing with local and international scientist and researchers from whom participants, volunteers, and members of the staff, like me, had the privilege to learn, to exchange ideas, and also to connect and foster future collaborations. The workshop brought together leaders in Carbon and Restoration Research, for example: Dr. Thomas E. Lovely whose contribution to Environmental Policy and International Conservation are well known around the world; Dr. Robin Chazdon whose understanding on social and ecological drivers of tropical reforestation and her long-term research in forest regeneration around Costa Rica made her the perfect participant for this small gathering; Carlos Manuel Rodriguez who has greatly contributed to the Costa Rican Environmental Policy and to the understanding the economics of conservation; Jorge Rodriguez and Oscar Sanchez from the National Forestry Financing Fund (Fonafifo) in charge of payment of environmental services provided by forests in Costa Rica, as well as many early career researchers like Philip Taylor, Megan Nasto, Brooke Osborne, Silvia Alvarez-Clare, Maga Gei, and Faith Inman-Narahari all researching different aspects of nutrient sequestration and availability or Anton Weissenhofer, Daniel Jenking, Rebecca Cole more focused in forest restauration. Max Villalobos and Jim Palmer represented Osa Conservation by explaining the future reforestation plans for our Finca Osa Verde which includes experimental restoration plots that are already being studied. Gloriana Chaverri, also a workshop participant, explained how she is using one of them to investigate the use of artificial bat boxes and guano extracted seeds in tropical forest restauration. (L-R): Adam Parr, Phil Taylor, Rebecca Cole, Megan Nasto, Cory Cleveland, Silvia Alvarez-Clare, Justin Pepper, Renée McKeon, Gloriana Chaverri; L-R: Jorge Rodriguez, Chris Balzotti, Jane Hamilton, Patricia Perles, Tabea Zimmermann, Brooke Osborne, Robin Chazdon, Faith Inman-Narahari, Tom Lovejoy, Jim Palmer, Maga Gei; L-R: Oscar Sanchez, Max Villalobos, Charlie Wheeler, Bea Lopez, Anton Weissenhofer Daniel Jenking, Alejandro Muñoz, Manuel Ramirez, Stephen Porder. “The world has its eyes on conservation and climate change” said Justin Pepper referring to the global agreement in climate change signed in Paris. “Humans need to transition from being clever to being wise” said by Thomas Lovejoy discussing human’s use of resources and climate change. 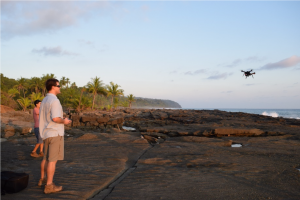 The highlight for me was to see the potential of new technologies such as the Airborne Mapping System which combines laser and spectral instrumentation aboard a plane to reveal an ecosystem’s chemistry, structure, biomass, and biodiversity presented by Philip Taylor or the work that Eben Broadbent is carrying out with drones that are able to monitor human-environment interactions and their impacts on ecosystems. Personally, one of the things that impressed me the most, was the high number of accomplished female researchers present at the Workshop. Being a female researcher myself, I was always divided between having a successful professional career and having a family. Chatting to some these women, I learnt that there is no need to compromise and that we can get the best of both worlds. In fact, researcher’s children often accompany their parents when they carry out their research fieldwork. These experiences are very positive for the kids as they get exposed to people with different backgrounds, new cultures, get close to nature, and learn about the importance of conservation which can be decisive to achieve some of the challenges that we and planet earth are facing.